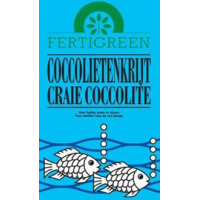 Fertigreen coccoliths chalk is a 100% natural mineral product whose main component is a calcium carbonate with a soft structure. This calcium carbonate is derived from marine fossils millions of years ago on the seabed ended. 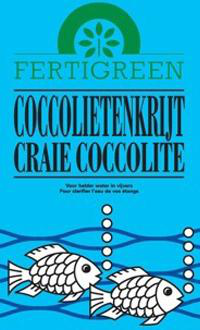 Due to its exceptional microstructure makes it coccolietenkrijt a very strong biological activity. The very fine structure automatically ensures a uniform distribution in the pond. 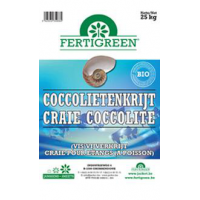 Fertigreen coccoliths chalk neutralizes the acidity and ensures that the soil pH is restored so that the aerobic bacteria (that require oxygen) the opportunity to develop themselves and the mud layer, ie the organic sludge, abort. On an anoxic soil can assert no worms or other invertebrates develop, leaving the soil burrowing species such as bream and carp not find food. The soil is than a kind of 'underwater desert'. The thicker the mud layer, the more poisonous gases are produced by fermentation in the sludge. Makes the water is clear and restore the flora and fauna. 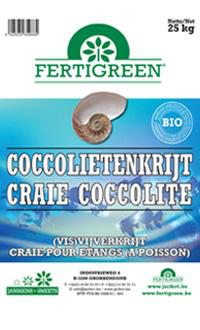 Fertigreen coccoliths chalk should be well mixed with the water to be distributed and is best in spring, when the water is fresh and oxygenated. The best effect is obtained in natural ponds and ponds with a natural soil. Followed by maintenance of 250 to 300 g per m2 water surface. As coccoliths chalk for several months employed, the beneficial effect long after the application period are visible. This treatment can be annual sludge formation with several inches to reduce.